“The Adventists,” is a new documentary film that will air on PBS. Filmmaker Martin Doblmeier explorers the Seventh-day Adventist Church’s health care system. The film comes at a time when the United States Congress debates over health care reform in the U.S. The documentary re-enacts important events in how the Adventist Church was founded and includes scenes about the Adventist-created Battle Creek Sanitarium. The film highlights Loma Linda University Medical Center’s Dr. Leonard Bailey, who became famous for the transplant of a baboon’s heart to “Baby Fae.” It also follows one family’s fight to keep their 5-month old son alive. Doblmeier compared The Adventists to one of his previous films (The Power of Forgiveness) in which it was able to start thousand of conversations around the country on the topic of forgiveness. 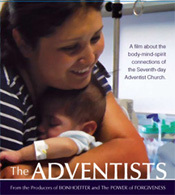 “The Adventists” is expected to be released on DVD in January 2010 and is scheduled to air on PBS in April 2010. Below, you can watch the trailer and several clips of the new documentary. Watch more clips from the film by clicking the link below. "3D Computer Images of the Body"
"3D Computer Images of the Heart"
"George Knight on John Harvey Kellogg"
"Dr. Vipul Patel in Robotic Surgery"
See the rest of the video clips on YouTube. I am quite excited about this documentary. Thank you for sharing these clips! Thanks for the clips. Going to the screening of it tonight at the Forest Lake Church in Orlando, Florida. Should be good. Does anyone know what is the actual date and time that it will air? I want to make sure that I don't miss it.... thanks. Are those "bonnets" that the women are wearing or did Adventist women wear "coverings" in times pasts? I am just curious to know. Thanks for the clips. I can't wait to watch this. The scene you are referring to is a reenactment set in the 1800's. If we're not mistaken, bonnets were popular among American women back in time. I saw The "Adventists" at Pioneer Memorial Church last week. It was fantastic! It was much more than I had expected. Do not miss the chance to see it! How can I find out WHEN in April PBS will be airing The Adventists documentary? So far, all I've seen is that it will be shown in April. 1) By clicking the like button on the Facebook box we currently have on here. 3) By copy/pasting the post link or www.asabbathblog.com on your Facebook wall. I always enjoy watching documentaries because of the way it stays as real as it is. Not much special effects and very close to what really is happening around us.